The Four Little Women of Roxby , by May Hollis Barton was another "grab on a whim" find at a somewhat local used book store. (I love poking around used book stores in small towns. It's like going on a treasure hunt!) I was browsing the Middle Grade section and stumbled across this title and noted the copyright (being 1926) and just could not resist. I selected it on the same trip when I picked up The Magic Pudding (linked to my review) and I'm thinkin' that was a pretty successful outing! 1. Four Little Women of Roxby is part of a 15 book series published by Cupples & Leon between 1926 and 1932. These 15 books were published as The Barton Books for Girls. 2. May Hollis Barton was the publishers "house name." In other words, there is no May Hollis Barton. An author by the name of W. Bert Foster is credited with having written some of the titles in the Barton Books series, but I can't find any evidence that he wrote Four Little Women of Roxby . In fact, I can't find any evidence whatsoever for who actually wrote it. Here is the list of the 15 Barton Books for Girls along with the shared advertisement. The four orphaned sisters, Jean, Alice, Corny and Bab, live on the outskirts of the town of Roxby. They have very little money and are struggling to make ends meet. Each of them have talents particular to their character which makes one sister suitable for dressmaking and the other for tending to shops. Babs is the youngest and she is plagued with some mysterious illness which keeps her in bed and requires expensive medicine to treat the disease. For a time, the girls are unsure whether not she'll pull through but from the opening pages of this book you know that this is a happily-every-after type of story and that everything will be fine in the end. 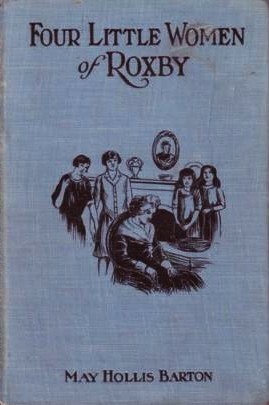 The full title, being Four Little Women of Roxby or The Queer Old Lady Who Lost Her Way, gives clue to the other aspect of the story. In the dead of winter an old lady comes stumbling up to the girl's small house and is clearly in need of shelter. She was on her way to visit her half-sister but lost the card with both her sister's name and address on it. (She also cannot remember her half sister's name.) Being that there is no way to contact this woman's relations, the girls take her in and dub her their "Godmother" for, as it turns out, she is a skilled nurse who helps bring good ol' Bab back to life. Did you ever read any of the Five Little Peppers books? I had a couple of them growing up and think I read one more later on. I remember the first one fondly and read it many times. My first thought was that it looked/sounded similar to Little Women. It does sound like a very sweet, old-fashioned story. Re Trish's comment above. I loved Five Little Peppers and How They Grew. I didn't know there were more books about them, though. A very profitable shopping trip indeed. What an interesting find.